In dual language education much research has focused on the acquisition of academic content or the acquisition of language. However, as Valdes (1997) argued, dual language education does not occur in a sociocultural vacuum. Rather, it reflects the contexts and power structures within which it exists. In the U.S. dual language education confronts the national dilemma of a majority/minority student achievement gap. In the South, this dilemma is known as the Black/White Achievement Gap. This study examines the Black/White Achievement Gap in a very specific sociocultural context—Southwestern Louisiana—where many African-American students also have francophone cultural heritage. The Black/White Achievement Gap is an issue that cannot be overlooked. Hedges and Nowell (1998) determined that there is still a significant gap in Black/White achievement, especially in the top 10% of achievement test score distribution. More importantly, these authors note that this distribution has not changed significantly since 1965. If the achievement gap cannot be closed at the elementary and secondary levels, the racially unequal social stratification is likely to become even more pronounced. In this age of high-stakes testing, a disproportionate number of African-American students risk being retained or tracked into lower-level classes, thereby becoming ineligible for college admission. Having taught French immersion (FI) for nine years in Title I schools with 40-99% African-American students, I had always been impressed with my students’ academic progress in the program. Despite, this teacher’s hunch, the true impetus of this research was the threatened closing of all four Louisiana FI programs in schools with over 90% African-American students.1 This situation came about even though previous research in the U.S. had indicated certain benefits for African-American students in the language immersion context. For example, early studies of partial immersion students in a large urban school district had shown language benefits but relatively few academic benefits in primary school (Holobow, Genesee, Lambert, Gastright, & Met, 1987; Holobow, Genesee & Lambert, 1991). More recently, Caldas & Boudreaux (1999) found general academic benefits for African-American FI students in late elementary immersion classrooms. Apart from these studies, however, little research has been conducted on the effects French immersion has on the academic achievement of African-American students. This study examined differences in minority/majority student achievement in both the French immersion (FI) and the regular education (RE) classroom contexts. In addition, it explored how African-American students, their peers and their teachers (1) perceive themselves, (2) perceive others, and (3) interact within each school setting. This article reports on the quantitative findings alone. 3. Whether there was any interaction effect between these student groups. A total of 347 grade four students participated in the quantitative phase of the study. Of these students 163 were in the FI program and 184 were in the RE program. Table 1 summarizes information on the socioeconomic status (SES) and the ethnicity of the participants. While the number of students who paid full lunch prices and the number of White students were equivalent in both fourth grade classrooms, the RE setting had nearly thirty more students on free lunch. 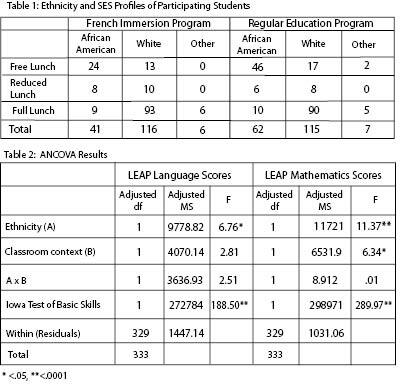 More White students in both program contexts were in the higher SES category and paid full price for their lunches while the majority of African-American students in both contexts were in the lower SES category (either free or reduced lunch programs). In terms of ethnicity, there were over twenty more African-American students in the RE classes than in the FI classes. This was after one FI class was excluded from the study because it had no African-American students despite the school having a 40% African-American student population. Students from other ethnic backgrounds were balanced across programs. Initial findings of the quantitative data analysis revealed (1) that White students scored significantly higher that African-American students [see ethnicity (A)], and (2) that FI students scored significantly higher than RE students [see classroom context (B)]. The combined effect of ethnicity and program context were not shown to significantly impact test performance (Table 2). A closer examination of the subgroups found that there was no significant difference in test scores between African-American students regardless of program context (see Table 3 on page 10). This supports Holobow et al. (1987; 1991) earlier findings that African-Americans in dual language programs do as well as African-Americans in regular education. However, it must be noted that in the area of mathematics there was also no significant difference between the math scores of African-American FI students and the White students in RE (although there was a significant difference between African-American RE students and White RE students). This may indicate a bridging of the achievement gap, but it does not fully support Caldas and Boudreaux (1999) who found that the achievement gap decreased or disappeared among immersion students from diverse racial backgrounds. This bridging of the achievement gap was found despite the fact that one third of the African-American students in French immersion were in a program which the qualitative phase found to be a less than ideal immersion setting. Because of the use of the third grade Iowa Test of Basic Skills (ITBS) scores as a covariate, the four years of immersion schooling prior to taking the ITBS were not taken into account. Considering that the FI students obtained ITBS scores were higher than the RE student scores, a longitudinal study of immersion which could account for those initial four years would be useful. Because of the pivotal role of parents who choose to place their children in immersion, the effect of this parental involvement on the children’s academic achievement also needs to be examined. The lack or absence of African-American students in immersion programs situated in schools with large African-American populations underscores the need to study which students enter or leave immersion and why. Finally, a replication of this study in a geographical area where French is not a heritage language for the African-American students could increase the generalizability of the findings in this study and allow for conclusions regarding the effect that learning a heritage language versus simply learning a second language has on students. Immersion is not a panacea for ameliorating African-American students’ education. However, in terms of the educational equity for African-American students, this study lends support to earlier findings and shows that African-American students’ are as academically successful in these programs as African-American students in non-immersion programs. Furthermore, the positive collective self-esteem (one of the findings from the qualitative phase of this study), extensive language skills and high LEAP scores of the FI students in well-implemented programs indicate that immersion is a beneficial environment for African-American and White students. 1 Two of the schools were closed after this study as part of school districts’ desegregation plans.